These little eggs are going to be the hit of your Easter table! Everybody makes deviled eggs at Easter, but these are something special. My kids have SO much fun dyeing Easter eggs each year that this year I wanted to take our colorful fun one step further, and dye the WHITE of the egg. This was so easy and we were so pleased with the results. I love that 3 of my kids got involved in the process, and loved the LEARNING that occurred while we were creating. As you work with your children, talk about color mixing. What do we need to mix together to make purple? How do we make orange? Keep asking questions and introduce new vocabulary as you work. Prompt your children to use their senses to talk about what you’re doing. Your children (and everyone else!) 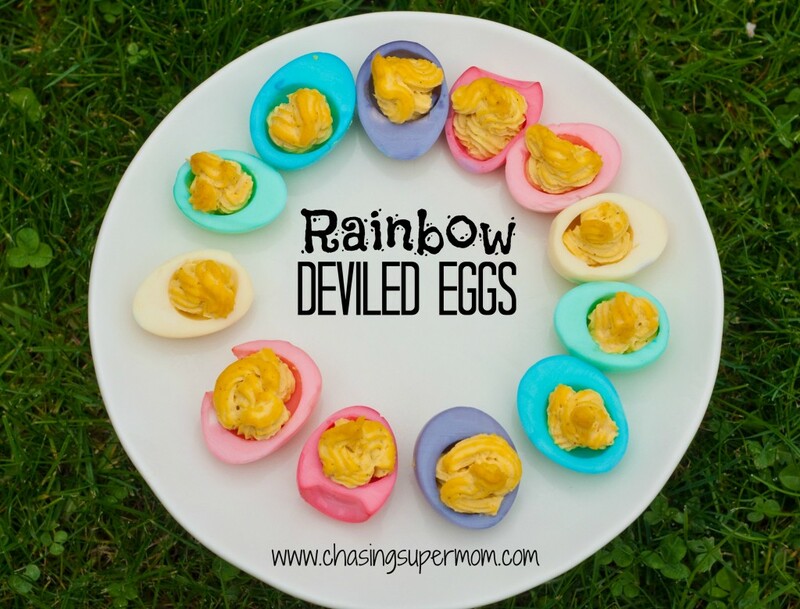 will LOVE these rainbow eggs. The bright color turns an ordinary Easter appetizer into something memorable. You won’t go back to boring old white deviled eggs again! 1. Hard-boil your eggs. I use the old-fashioned boiling water/ice water method. 2. Set out 6 small bowls or mugs. (I found that the mugs worked well as the eggs were fully submerged. Fill the cups/bowls 3/4 full with luke-warm water. 3. Create the different colors using food coloring. You’ll want to use a good amount of food coloring to achieve vibrant colors. I used 5-6 drops per cup. Experiment with the colors. It will be pretty hard to get a “red”, so you will likely need to settle for a nice bright pink. 4. Peel the hard-boiled eggs and carefully cut them in half. Scoop out the yolks and set aside for the filling. 5. Drop the egg white halves into the colored water of your choice. Let the whites sit for at least 30 minutes. You can keep checking your whites to see if they’ve reached the desired level of brightness. 6. Carefully place the colored whites onto a paper towel, and then transfer to your serving plate. Pipe your deviled egg filling into the whites. Serve and enjoy! Your family and friends will love these colorful little eggs! These are such a great idea! I wonder if natural dyes would work as well. I’m sure they would. I think you may have to leave them a bit longer, but it would work. Great idea! mayo, works great and then you won’t miss out on the fun!